Nestle Malaysia has unveiled a new Tropicana Lychee Yoghurt Flavour ice cream with yoghurt powder from France. The choice of French yoghurt powder is interesting. France is often associated with premium indulgent ice creams eg Häagen-Dazs. 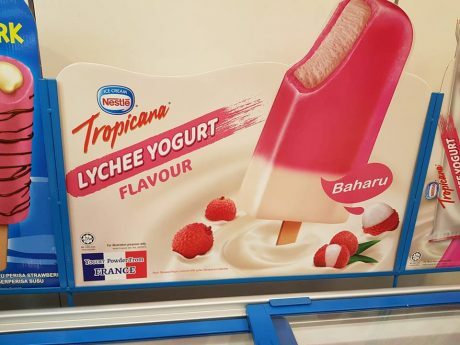 French yoghurt is few and far between in Malaysia with most yohurt coming from Australia and the US. However, the ice cream needs the exotic, indulgent twist that only French, Greek or Bulgarian yogurt can deliver. 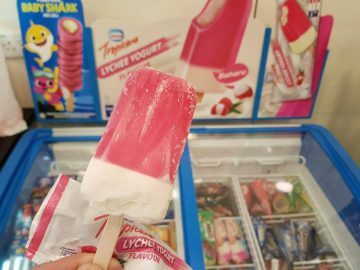 With the addition of French yoghurt powder, the new ice cream now fetches a price of RM 1.90 compared with RM 0.95 for the ordinary Tropicana Lime. Perhaps the next step is French, Greek or even Bulgarian yoghurt ice cream?